This article provides a detailed protocol for the preparation and evaluation of monoclonal antibodies against natural products for use in various immunoassays. This procedure includes immunization, cell fusion, indirect competitive ELISA for positive clone screening, and monoclonal hybridoma preparation. The specifications for antibody characterization using MALDI-TOF-MS and ELISA analyses are also provided. Zhang, Y., Cao, P., Lu, F., Yan, X., Jiang, B., Cheng, J., Qu, H. Generation of Monoclonal Antibodies Against Natural Products. J. Vis. Exp. (146), e57116, doi:10.3791/57116 (2019). The analysis of the bioactive components present in foods and natural products has become a popular area of study in many fields, including traditional Chinese medicine and food safety/toxicology. Many of the classical analysis techniques require expensive equipment and/or expertise. Notably, enzyme-linked immunosorbent assays (ELISAs) have become an emerging method for the analysis of foods and natural products. This method is based on antibody-mediated detection of the target components. However, as many of the bioactive components in natural products are small (<1,000 Da) and do not induce an immune response, creating monoclonal antibodies (mAbs) against them is often difficult. In this protocol, we provide a detailed explanation of the steps required to generate mAbs against target molecules as well as those needed to create the associated indirect competitive (ic)ELISA for the rapid analysis of the compound in multiple samples. The procedure describes the synthesis of the artificial antigen (i.e., the hapten-carrier conjugate), immunization, cell fusion, monoclonal hybridoma preparation, characterization of the mAb, and the ELISA-based application of the mAb. The hapten-carrier conjugate was synthesized by the sodium periodate method and evaluated by MALDI-TOF-MS. After immunization, splenocytes were isolated from the immunized mouse with the highest antibody titer and fused with the hypoxanthine-aminopterin-thymidine (HAT)-sensitive mouse myeloma cell line Sp2/0 -Ag14 using a polyethylene glycol (PEG)-based method. The hybridomas secreting mAbs reactive to the target antigen were screened by icELISA for specificity and cross-reactivity. Furthermore, the limiting dilution method was applied to prepare monoclonal hybridomas. 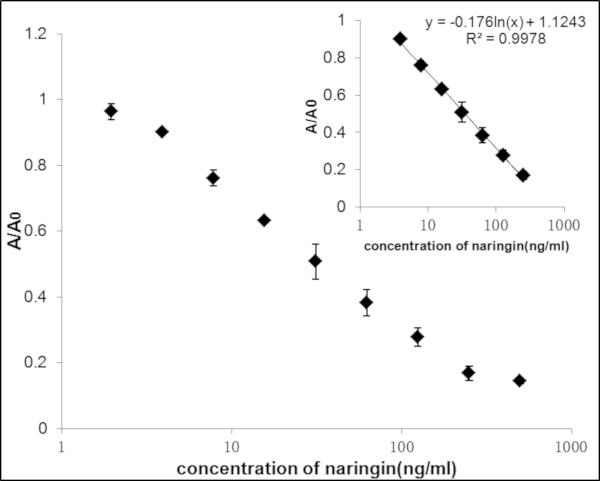 The final mAbs were further characterized by icELISA and then utilized in an ELISA-based application for the rapid and convenient detection of the example hapten (naringin (NAR)) in natural products. Monoclonal antibodies (mAbs), also known as mono-specific antibodies, are produced from a single B-lymphocyte clone and are composed of monovalent antibodies that all bind to the same epitope1. In recent years, many medicinal plant-derived natural products have been used in the treatment of various diseases2. Indeed, many small molecular compounds originally derived from natural products are now applied as first-line drugs, such as artemisinin for malaria and paciltaxel (taxol) for cancer2,3. The study of natural products has made rapid progress, largely due to the tremendous development and optimization of conventional analysis techniques, including high performance liquid chromatography (HPLC) and mass spectrometry (MS). However, there are still some limitations associated with these methods, such as their complex pretreatment protocols and associated costs with regards to time, labor/expertise, and required instruments4. Recently, mAb-based enzyme-linked immunosorbent assays (ELISAs) have been applied to qualitatively and quantitatively analyze food and natural products. In fact, this method has been applied for both biological samples analysis and clinical testing and has been shown to be accurate, sensitive, and highly efficient while also avoiding the tedious pretreatment steps associated with other analyses5,6. When using mAb-based ELISAs to study complex natural products, preparation of the monoclonal antibodies is one of the core steps. Unfortunately, the mAbs specific to the small bioactive components present in these types of substances6,7,8,9,10,11,12,13,14,15 are often limited compared to the protein antigens. To circumvent this issue, we have developed a protocol to specifically generate mAbs against small compounds. The protocol presented here includes artificial antigen synthesis, mouse immunization, cell fusion, indirect competitive ELISA, and monoclonal hybridoma preparation. Notably, our research group has been studying the formation of mAbs against small bioactive compounds from traditional Chinese medicines and developing their applications for years. In our on-going studies, we have developed mAbs against baicalin16, puerarin17, glycyrrhizic acid18, paeoniflorin19, ginsenoside Re20, ginsenoside Rh121, and many other small molecules. Our ELISA protocols based on these mAbs have been used in a number of studies to evaluate the pharmacokinetics of these small molecules as well as their interactions with other bioactive compounds. Moreover, using these mAbs, we have also developed immunoaffinity chromatography methods for the separation of structural analogues, including epimers. Recently, we prepared a lateral flow immunoassay using our anti-puerarin mAb that was subsequently used for rapid, on-site detection of this compound. Our results indicate that our mAb-based assays are indispensable and convenient tools for studying the biology and quality of natural-product-derived compounds, particularly those used in traditional Chinese medicines. All of the animal procedures performed in this study have been approved by the Ethical Review Committee at the Beijing University of Chinese Medicine (approval number 2016BZYYL00109). NOTE: Female BALB/c mice (8 weeks old) were immunized with hapten-carrier protein conjugates. When used alone, a small molecule (<1,000 Da) cannot elicit an immune response. However, conjugating the small molecule to a carrier macromolecule results in antigen synthesis. In this context, the small molecule is labeled a hapten. Hapten conjugation is a necessary and effective strategy for mAb production. To avoid cross reactivity, two different protein carriers, such as bovine serum albumin (BSA) and ovalbumin (OVA) or keyhole limpet hemocyanin (KLH) and BSA, should be used as the immunogens (for animal immunization) and coating antigens (to coat the plate for anti-serum detection). BSA and OVA are used as an example in this protocol. NOTE: For artificial antigen synthesis, use the appropriate functional group (e.g., hydroxyl, sulfhydryl carboxyl acid, or amino) as the side arm for covalent binding with the carrier protein. The conjugation methods include periodate oxidation, the carbodiimide method, a mixed anhydrides reaction, a glutaraldehyde reaction, and the succinate method. This protocol uses naringin (NAR), a well-known flavanone glycoside, as an example compound. NAR is a small compound (581 Da) present in citrus fruits as well as various traditional Chinese medicines. Use a periodate oxidation procedure to synthesize NAR-BSA and NAR-OVA conjugates. Dissolve 50 mg of NAR in water at a final concentration of 1 mg/mL22. Add 100 µL of freshly prepared sodium periodate solution (0.1 M) to 5 mL of the NAR solution. Stir the mixture at room temperature for 1 h.
Dissolve 4 mg of BSA and OVA in 2.0 mL of 50 mM carbonate buffer (pH 9.6). Add this protein solution to the NAR/sodium periodate reaction mixture. Adjust the mixture to pH 9 with 1 M Na2CO3 solution and stir at room temperature for 6-8 h.
Dialyze the reaction mixture in phosphate-buffered saline (PBS) using a dialysis membrane (MWCO 10 kDa) for 3 days to exchange the CBS. Analyze the hapten-carrier conjugate using matrix assisted laser desorption/ionization time of flight (MALDI-TOF)-MS. Mix 1-10 pmol of the conjugate with a 103-fold molar excess of sinapinic acid in an aqueous solution containing 0.15% trifluoroacetic acid (TFA). Dry the mixture on a sample plate in air. Perform the analysis using a MALDI-TOF mass spectrometer equipped with a pulsed nitrogen laser operated at 337 nm. Acquire positive ion MALDI mass spectra in the linear mode within the mass range (m/z) of 15,000-100,000 as previously described22. NOTE: A total of 5 BALB/c female mice (8 weeks old) were used: 4 for NAR conjugate immunization and 1 for control (PBS) immunization. For the first vaccination, mix 50 µg of conjugate (diluted in 100 µL of PBS) with an equal volume of Freund's complete adjuvant (CFA) and emulsify completely. Administer 100 µL of this mixture to each mouse via dorsal subcutaneous injection. Two weeks later, deliver a booster vaccination (100 µL) via subcutaneous injection with the same amount of conjugate mixed with incomplete adjuvant (IFA). Extract 200 µL of blood from the tail vein of every mouse 7 days later to obtain serum. Centrifuge the blood at 3,000 x g for 10 min. Transfer the serum supernatant to a fresh tube. 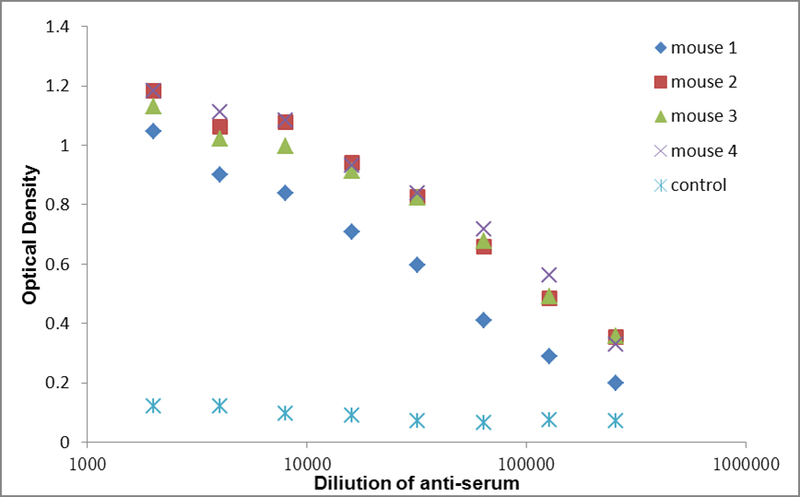 Analyze the serum using an ELISA as previously described21. Choose the mouse with the highest serum titer to use for cell fusion. In preparation for cell fusion, administer a pulsed immunization to the chosen mouse via intraperitoneal injection of 50 µg of the conjugate in 300 µL of PBS without adjuvant 3 days before fusion. NOTE: This step can be omitted if the titer is high enough. For the hypoxanthine-aminopterin-thymidine (HAT) selective medium: Dissolve the 50x HAT media supplement in 10 mL of RPMI-1640 and add this mixture to 500 mL of RPMI-1640 containing 20% FBS. NOTE: When 10 mL of the 50x concentrate are diluted in 500 mL of culture medium, the final concentrations of hypoxanthine, aminopterin, and thymidine are 100 µM, 0.4 µM, and 16 µM, respectively. For the hypoxanthine-thymidine (HT) media: Dissolve the 50x HT media supplement in 10 mL of RPMI-1640 and add this mixture to 500 mL of RPMI-1640 containing 20% FBS. The final concentrations of hypoxanthine and thymidine are 100 µM and 16 µM, respectively. At least 7 days before fusion, rapidly thaw a vial of liquid nitrogen-frozen SP2/0-Ag14 myeloma cells in warm water. Transfer the cell solution into 5 mL of fresh culture medium (RPMI-1640) and centrifuge for 10 min at 1000 x g.
After centrifugation, remove the culture medium and resuspend the cells in fresh RPMI-1640 supplemented with 10% fetal bovine serum (FBS). Transfer the cells and medium into a 25 cm2 flask and incubate at 37 °C in an atmosphere of 5% CO2. Expand the cells to 3 or 4 75 cm2 flasks before fusion. Sacrifice a 12-week-old albino ICR mouse by cervical dislocation 1 day prior to cell fusion and submerge it in 75% ethanol. After removing the fur from the abdomen with hemostatic forceps, disinfect the area with 75% ethanol. Cut the outer skin to expose the abdominal cavity. Inject 3 mL of sterile RPMI-1640 medium into the abdomen and massage the abdomen to detach additional cells into the solution. Aspirate the feeder cell suspension into a 15 mL centrifuge tube. After centrifuging the cell suspension for 10 min at 1000 x g, discard the supernatant and resuspend the feeder cells in 20 mL of HAT selective medium. Transfer the cells into 96-well cell culture plates (100 µL/well). Incubate the plates overnight at 37 °C, 5% CO2. After the chosen immunized mouse has been prepared for cell fusion (see step 2.4), administer an intraperitoneal injection of 10% chloral hydrate (anesthetic) and sacrifice the immunized mouse via cervical dislocation. Collect additional blood from the heart (1 mL), and prepare serum as described in step 2.3.1 to use as a positive control during hybridoma selection. Remove the skin and muscle tissue using scissors to expose the spleen. Isolate the spleen with tweezers carefully and wash the spleen with RPMI-1640. Cut the spleen into pieces and slowly pound the spleen to triturate. Prepare a spleen cell suspension by pressing the spleen tissue through an 800 mesh cell strainer into a 50 mL centrifuge tube. Wash the spleen cell suspension with RPMI-1640 medium. Harvest the spleen cells by centrifugation (1000 x g, 10 min, and 4 °C), and then discard the supernatant. Repeat this washing step three times. Remove the cultivated and amplified myeloma cells from the incubator and gently tap/shake the flasks to obtain a cell suspension. Wash this suspension with RPMI-1640 medium twice to remove the FBS. NOTE: This is an essential step as FBS may influence cell fusion. Count the cells and adjust the concentration before mixing with the spleen cells. The final ratio of spleen cells to myeloma cells should be between 1:5 and 1:10. Mix the spleen cell suspension and myeloma cells. Centrifuge the cell mixture (1000 x g, 10 min, and 4 °C), and remove the supernatant. Add 1 mL of 50% polyethylene glycol (PEG) solution to the cells and gently stir at 37 °C for 1 min. Let stand for 30 s.
NOTE: The PEG solution used in this step should contain 50% (w/v) polyethylene glycol 1500 and 10% (v/v) dimethyl sulfoxide (DMSO) in PBS without calcium (Ca2+). Add 2 mL of RPMI-1640 medium for 2 min to terminate the reaction. Add an additional 2 mL of RPMI-1640 medium for another 1 min, and then add an additional 10 mL of RPMI-1640 medium. Centrifuge the cells at 800 x g for 10 min. After discarding the supernatant, add HAT solution and continue to cultivate the cells. Then add 100 µL of the cell suspension to each well of the feeder layer plates and incubate the plates for 7 days at 37 °C, 5% CO2. NOTE: Under these conditions, the unfused myeloma cells will die while the hybridoma cells will continue to grow in the HAT medium. After 7 days, monoclonal hybridoma will form as a single cluster of cells in the well, while wells containing polyclonal hybridoma will have multiple clusters of cells. Aspirate the supernatant for analysis and replace the medium with HT medium. NOTE: Be sure to substitute the HAT medium with HT medium first as switching directly to unsupplemented medium is detrimental to the hybridoma. Coat a 96-well plate with NAR-OVA (1 µg/mL, 100 µL/well) and incubate for 1 h at 37 °C or overnight at 4 °C. Block the plate with 300 µL of GPBS (PBS containing 1% m/v gelatin) for 1 h at 37 °C to prevent non-specific adsorption. Wash the plate three times with TPBS (PBS containing 0.05% v/v Tween-20). Dilute unconjugated NAR into a series of concentrations with 10% methanol. Add 50 µL of these dilutions to separate wells. In the other wells, add 50 µL of anti-serum or hybridoma supernatant (containing mAbs). Incubate the plate for 1 h at 37 °C. Add 100 μL of peroxidase-labelled anti-mouse IgG into each well and incubate for an additional 1 h.
After washing the plate three times with TPBS, add 100 µL of substrate solution (0.1 M citrate buffer (pH 4) containing 0.015% v/v H2O2 and 2 mg/mL of 3, 3', 5, 5'- tetramethyl benzidine (TMB)) to each well and incubate for 15 min. Stop the reaction by adding 50 µL of 1 M H2SO4 to each well. Measure the absorbance using a microplate reader at 450 nm. Choose the hybridomas that secreted the highest concentrations of NAR antibodies into their supernatant for further preparation. Use the limiting dilution method to prepare the monoclonal hybridomas. After removing the HT medium from the selected hybridomas (i.e., those positive for NAR antibody secretion), resuspend the cells in RPMI-1640 and count them. Dilute the cells to a concentration of 1 cell, 2 cells, and 4 cells per well in 100 µL of RPMI-1640 in a 96-well plate. Incubate the plate at 37 °C, 5% CO2. After 7-10 days, detect the NAR antibodies in the culture supernatant using the icELISA protocol (step 5). Transfer cells from the hybridomas that are positive for NAR antibodies to 24-well plates, 25 cm2 flasks, and 75 cm2 flasks for cultivation. Harvest the cells and transfer them to centrifuge tubes. After centrifuging the cells (800 x g, 10 min), remove the supernatant and resuspend the cells in freezing medium (RPMI-1640, 20% fetal calf serum (FCS), and 10% DMSO). Transfer the cell suspensions to cryotubes. Store the cryotubes in a gradient cooling box at -80 °C for 24 h. Then transfer the cryotubes to liquid nitrogen for long-term storage. The molecular weight of the hapten-carrier conjugate was confirmed by MALDI-TOF-MS analysis. As the molecular weight of both BSA and the NAR are known, the number of small molecules conjugated with BSA could be calculated. 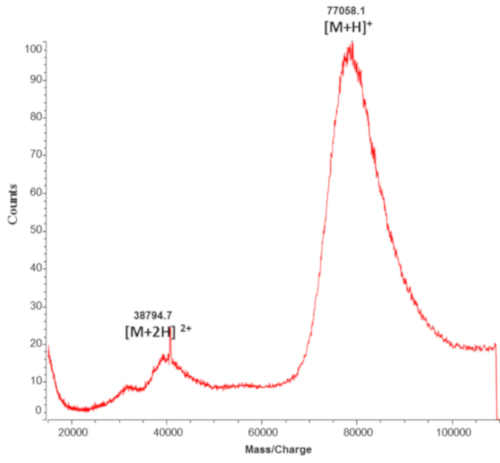 Figure 1 shows representative spectral results for NAR-BSA22, which displays a broad peak at m/z 77,058. As the average molecular weight of BSA is 66,430, it appears that at least 18 NAR molecules (MW 581) were conjugated with the BSA (molar coupling ratio (NAR:BSA) = 18:1). icELISAs were performed to determine the anti-serum titers following mouse immunization22. It appears that the serum antibody titers of the four mice immunized with the NAR-BSA conjugate were significantly higher than that observed for the control mouse (Figure 2). The mouse with the highest titer (over 1:5,000) was used for cell fusion. After the spleen cells from this mouse were fused to the abdominal feeder layer cells, the hybridomas were grown for 7 days inselection medium. Using icELISAs, the cell culture supernatant was tested, andthehybridomas positive for NAR mAbs were recloned and expanded. The images in Figure 3 illustrate the conventional outcomes for stable monoclonal and polyclonal hybridoma cell lines. The critical point of this experiment is the screening of mAb specificity. The results in Table 1 demonstrate that the mAb in this experiment reacted with NAR but not the blocking buffer or carrier proteins22. Furthermore, the specificity of the mAb was further evaluated by testing its cross-reactivity with structurally related compounds. Table 2 shows the calculated cross-reactivity rates. As the cross-reactivity rate for the other flavonoids tested were all less than 2%, it is clear that this mAb is specific for NAR22. An icELISA was developed using the anti-NAR mAb and highlights the application of this methodology. Using solutions containing known concentrations of NAR, a standard curve was plotted using the absorbances of these solutions and the linear range of the S model curve was calculated (shown in the upper-right figure inset). The linear regression equation (y=-0.176 ln(x) + 1.1243, R2 =0.9978) calculated for this curve can be applied to quantitative analysis of unknown samples. Using this splenocyte/myeloma cell fusion protocol, a monoclonal hybridoma secreting anti-glycyrrhizic acid mAb, named DF5, was also established18. The subtype of this DF5 mAb was identified as IgG1 with a kappa light chain (Table 3). Similar to the analysis above, the mAb was used for additional screening and applications, while the antigen-specific monoclonal hybridomas were expanded andcryopreserved in liquid nitrogen for long-term storage. Table 1. Reactivity of the anti-NAR mAb with NAR-OVA and carrier proteins. Table 2. Cross-reactivity (%) of the anti-NAR mAb against NAR and its related compounds. Table 3. Isotype analysis of mAb DF5. Figure 2: Analysis of anti-serum titer by icELISA. Mice 1- 4 were immunized with the NAR-BSA conjugate, while the control was immunized with vehicle (PBS). The data represent the mean ± standard deviation (SD) (n = 3). This figure has been modified from Qu et al., 201622. Please click here to view a larger version of this figure. Figure 3: Representative images of stable monoclonal (A) and polyclonal (B) hybridomas. Please click here to view a larger version of this figure. Figure 4: Application of the anti-NAR mAb in an icELISA.Various concentrations of NAR were incubated with mAb in wells pre-coated with NAR-OVA (1 mg/mL). A is the absorbance in the presence of NAR, while A0 is the absorbance in the absence of NAR. The data represent the mean ± standard deviation (SD) (n = 3). This figure has been modified from Qu et al., 201622. Here, we present a protocol for the successful production of mAbs against natural product-derived small molecules. The essential steps in the procedure have been outlined, and we have demonstrated the utility of this protocol using NAR as an example small molecule. The example spectra, reactivity analyses, and icELISA results all show representative experimental and control data that is obtained using this protocol. Example images of the hybridomas provide a visual representation of what the researcher should be looking for when differentiating between the monoclonal and polyclonal hybridomas. Taken together, we have demonstrated that the mAb production, characterization, and application strategy presented here results in the creation of an effective mAb against a small molecule as well as a novel ELISA based on the particular mAb that can be used to test the expression of the target molecule in other natural products. Working with any type of antibody, the most common issue that may arise during this procedure is associated with the sensitivity of the mAb. Indeed, there is a high risk that the mAb will not work as expected due to low sensitivity, high cross-reactivity, or other factors. As the whole procedure takes at least 4 months to perform in full, it is important to take care during the initial screening of the mAbs secreted from the hybridomas. One essential aspect to avoid creating an ineffective mAb is to screen the anti-serum by icELISA before cell fusion to confirmed reactive with the hapten but not the carrier. This is performed by using two different protein carriers (in this case BSA and OVA) as the immunogen and coating antigen carriers, respectively. During immunization with the hapten-BSA conjugate, the animals will produce antibodies against both the hapten (e.g., NAR) and BSA. Thus, to avoid the false-positive detection of anti-BSA antibodies during screening, hapten-OVA should be used to detect the anti-hapten antibodies specifically. The creation of these two protein carriers as well as when to use them is explicitly highlighted in the protocol. It is also important to note that during preparation of the monoclonal hybridomas, the limiting dilution method often needs to be repeated several times until all of the wells containing the monoclonal cells are positive. This repetition helps to confirm that every clone stably secrets the specific antibody. The limitations of this method include the complicated process of hybridoma generation and the time needed for selection of the desired antibody-producing hybridoma. However, once the mAb is obtained and the icELISA is developed, the detection of the target compound in natural products can be performed quickly and efficiently. Notably, this protocol does avoid some of the costs associated with other analysis techniques and does not require the use of expensive instruments repeatedly for every natural product tested. Once produced and screened, the hapten mAb can be widely used in a variety of analyses. In this protocol, we focused on the use of the mAb in an ELISA-based method that was used to study the biology of the small molecule as well as its pharmacokinetic interactions20,22. Other mAbs created with this protocol have also been used to establish an mAb-based immunoaffinity chromatography method for the separation of structural analogues18, including epimers21, as well as a lateral flow immunoassay23 for rapid and on-site detection of the target molecule. These studies highlight the broad application of mAbs produced using the protocol outlined here. Thus, this procedure, and the mAbs created, acts as a foundation for the development of various target mAb-based immunoassays that can be effectively utilized as analytical tools for the evaluation and quality control of nature products. This work was supported by the National Natural Science Foundation of China (grant numbers 81573573, 81473338, and 81503344) and the Classical Prescription Basic Research Team at the Beijing University of Chinese Medicine. Kohler, G., Milstein, C. Continuous cultures of fused cells secreting antibody of predefined specificity. Nature. 256, 495-497 (1975). De Smet, P. A. Herbal remedies. The New England journal of medicine. 347, 2046-2056 (2002). Rowinsky, E. K., Donehower, R. C. The clinical pharmacology of paclitaxel (Taxol). Seminars in oncology. 20, 16-25 (1993). Yan, X., Zhao, Y., Zhang, Y., Qu, H. Monoclonal Antibodies and Immunoassay for Medical Plant-Derived Natural Products: A Review. Molecules. 22, (2017). Loungratana, P., Tanaka, H., Shoyama, Y. Production of monoclonal antibody against ginkgolic acids in Ginkgo biloba Linn. The American journal of Chinese medicine. 32, 33-48 (2004). Fujii, S., Morinaga, O., Uto, T., Nomura, S., Shoyama, Y. Development of a monoclonal antibody-based immunochemical assay for liquiritin and its application to the quality control of licorice products. Journal of agricultural and food chemistry. 62, 3377-3383 (2014). Ishiyama, M., Shoyama, Y., Murakami, H., Shinohara, H. Production of monoclonal antibodies and development of an ELISA for solamargine. Cytotechnology. 18, 153-158 (1995). Xuan, L., Tanaka, H., Xu, Y., Shoyama, Y. Preparation of monoclonal antibody against crocin and its characterization. Cytotechnology. 29, 65-70 (1999). Leu, J. G., Chen, B. X., Schiff, P. B., Erlanger, B. F. Characterization of polyclonal and monoclonal anti-taxol antibodies and measurement of taxol in serum. Cancer research. 53, 1388-1391 (1993). Zhu, S., Shimokawa, S., Shoyama, Y., Tanaka, H. A novel analytical ELISA-based methodology for pharmacologically active saikosaponins. Fitoterapia. 77, 100-108 (2005). Phrompittayarat, W., et al. Determination of pseudojujubogenin glycosides from Brahmi based on immunoassay using a monoclonal antibody against bacopaside I. Phytochemical analysis. 18, 411-418 (2007). Limsuwanchote, S., et al. Preparation of a monoclonal antibody against notoginsenoside R1, a distinctive saponin from Panax notoginseng, and its application to indirect competitive ELISA. Planta medica. 80, 337-342 (2014). Tanaka, H., et al. Isolation of ginsenoside Rb1 from Kalopanax pictus by eastern blotting using anti-ginsenoside Rb1 monoclonal antibody. Phytotherapy research. 19, 255-258 (2005). Morinaga, O., Nakajima, S., Tanaka, H., Shoyama, Y. Production of monoclonal antibodies against a major purgative component, sennoside B, their characterization and use in ELISA. The Analyst. 126, 1372-1376 (2001). Sakamoto, S., et al. Simultaneous determination of soy isoflavone glycosides, daidzin and genistin by monoclonal antibody-based highly sensitive indirect competitive enzyme-linked immunosorbent assay. Food chemistry. 169, 127-133 (2015). Shan, W., et al. Development of a Fluorescence-Linked Immunosorbent Assay for Baicalin. Journal of fluorescence. 25, 1371-1376 (2015). Qu, H., et al. Development of an enzyme-linked immunosorbent assay based on anti-puerarin monoclonal antibody and its applications. Journal of chromatography B, Analytical technologies in the biomedical and life sciences. 953-954, 120-125 (2014). Zhang, Y., et al. Development of an enzyme-linked immunosorbent assay and immunoaffinity chromatography for glycyrrhizic acid using an anti-glycyrrhizic acid monoclonal antibody. Journal of separation science. 38, 2363-2370 (2015). Zhao, Y., et al. Development of Fluorescence-Linked Immunosorbent Assay for Paeoniflorin. Journal of fluorescence. 25, 885-890 (2015). Qu, H., et al. Establishment of an enzyme-linked immunosorbent assay and application on determination of ginsenoside Re in human saliva. Planta medica. 80, 1143-1150 (2014). Qu, H., et al. Development of ELISA for detection of Rh1 and Rg2 and potential method of immunoaffinity chromatography for separation of epimers. Journal of chromatography B, Analytical technologies in the biomedical and life sciences. 985, 197-205 (2015). Qu, H., et al. Novel immunoassay and rapid immunoaffinity chromatography method for the detection and selective extraction of naringin in Citrus aurantium. Journal of separation science. 39, 1389-1398 (2016). Qu, H., et al. Rapid lateral-flow immunoassay for the quantum dot-based detection of puerarin. Biosensors & bioelectronics. 81, 358-362 (2016).